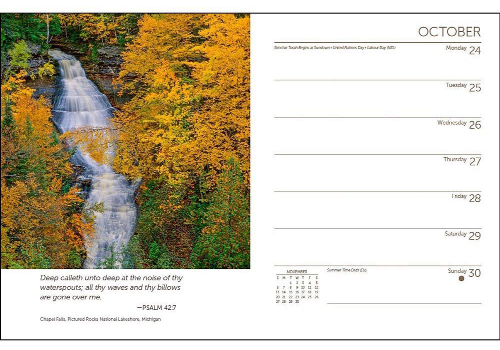 Psalms Softcover Planner Carr Clifton's splendid nature photography complement the verses from the King James version of the Bible's Book of Psalms beautifully. This is a spiral-bound appointment calendar. Each page covers one week. Deep calleth unto deep at the noise of they watersprouts; all thy waves and thy billows are gone over me. The Christian Day by Day Datebook has 16 pages of biblical references including a list of Books of the Bible, list of Parables, Ten Commandments, list of Miracles, list of Apostle Paul's Letters, and a Glossary of Theological Terms. This Datebook also features a weekly and monthly layout plus a phone book section; Weight/Measurement conversions, notes, recommendations for restaurants, books and movies and a pocket folder for loose papers and tickets. But the salvation of the righteous is of Jehovah; He is their stronghold in the time of trouble. 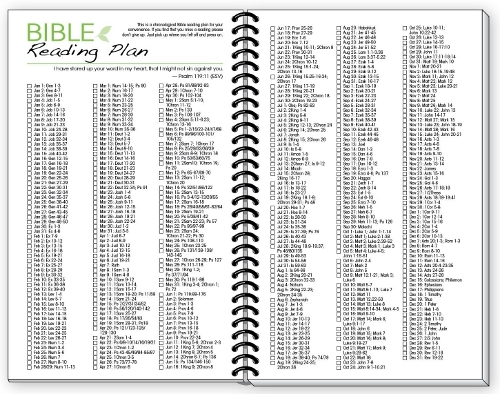 Paired with verses of praise from the Psalms, this Christian Planner helps you schedule your week while enjoying majestic mountain and National Park locations. Stay close to God all week long aided by this wonderful pairing of nature and and the Psalms. Each day has a Scripture reference to take you through the whole Bible in 365 days. This calendar is eco-friendly - printed using vegetable-based inks on FSC paper, all fully recyclable. Also available is a wall calendar, mini wall and a desk calendar that can be used in conjunction with this engagement calendar or instead of.